Walking through a noisy downtown is a lot more enjoyable if you’re wearing a pair of Shure’s SE210 sound-isolating earbuds. The preproduction set I tried delivered full, rich sound and kept all but the loudest noises from intruding on my music. The set costs $299, which may sound like a big investment considering the low price of some of today’s portable audio players. But one reason those players are so affordable is that they come with mediocre headphones. I compared the Shure earbuds with those included with an Apple iPod and found the sound quality of the SE210 set much better, adding depth and reproducing subtleties I hadn’t noticed with the Apple earbuds. The SE210’s full bass response and crisp highs make for a pleasant listening experience. In particular, the Shure earphones demonstrated how much changing the iPod’s equaliser setting alters the audio; when I used them, the difference over listening without the EQ seemed far more pronounced than when I listened with Apple’s earbuds. 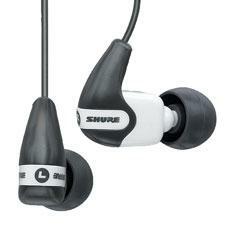 The SE210 set is the entry-level model in Shure’s new SE product line, and has a single micro-speaker for each channel. In comparison, the $699 SE420 earbuds each have a dedicated tweeter and woofer. I tried the SE420 also, and appreciated that pair’s better defined low end and subtly smoother response in the upper frequencies. That additional fine-tuning, however, comes with a price tag that’s more than double the cost of the SE210. The short cable of the SE210 is ideal if you have a small flash player you want to clip to your jacket or put in a shirt pocket. The included metre-long extension cable allows you to stash your player in a bag; it also offers a convenient way to unplug the earphones without having to hunt down your audio player (even without music playing, carrying on a conversation while wearing sound-isolating earphones can be difficult). In addition, the design lets you easily add a Shure Push-To-Hear module (which has a microphone that pipes in outside noise). The only drawback is that this connection adds a little weight to the cable. The SE210 earbuds may seem expensive, but the price is a small one to pay for full-bodied sound and music enjoyment without any interruptions from the noisy, outside world.